The 2012 Central Ohio Home & Garden Show pays tribute to the 200th anniversary of the city’s founding. WIth the garden design theme, “Happy Birthday Columbus,” designers across Columbus have created landscape representations of areas like the Brewery District, Columbus Museum of Art, Goodale Park and the Arena District — each exhibiting unique attributes and architectural elements of the area’s historic and present day layout. The Central Ohio Home & Garden Show will take place at the Ohio Expo Center from February 25 to March 4, 2012. Experts will be on-site as your resource for your garden needs. Advance discount tickets available at all Central Ohio Kroger locations, customer service counter for $10 each. $1.50 from every ticket sold at Kroger benefits Nationwide Children’s. 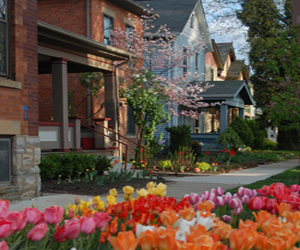 Get a sneak preview of the creative gardens representing Columbus icons and historic neighborhoods on February 24th, 2012, from 6:30 p.m. to 10 p.m.. Hors d’oeuvres and cocktails will be served. Admission donation of $75 per person. Proceeds benefit The Development Board of Nationwide Children’s Hospital’s support of Pediatric Research at the Research Institute at Nationwide Children’s Hospital. For more information, please contact Cindy Laux at (614) 355-0819. Can’t attend the event? Make a gift now!